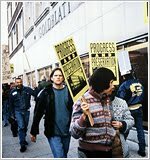 East Village Association's 1996 campaign to save the Goldblatt’s Building at Chicago and Ashland is marked in a free Sept. 20 noon-hour lecture at the Chicago Cultural Center, 78 E. Washington Blvd. EVA director Gladys Alcazar-Anselmo will recall the preservation campaign's creative and often humorous methods, and their continuing effects. The lecture in the Claudia Cassidy Theater is part of Landmarks Illinois' Preservation Snapshots series.